Last year’s The Shallows was a reminder that, despite most shark attack movies being relegated to B-movie status nowadays, there could still be some intense and compelling movies to be made out of that sub-genre. Conversely, here comes 47 Metres Down to remind us all that shark movies are still very much fodder for schlocky and disposable B-movies, and that this one is no exception. Directed by Storage 24 and The Other Side of the Door’s Johannes Roberts, who seems to have become so convinced of his name being that of a legitimate auteur that his name literally appears above the main title in the opening credits, the film is about as basic a story as you can imagine. It’s about a couple of girls (Mandy Moore and Claire Holy) who, while on holiday in Mexico, are convinced to go cage diving with sharks, but end up 47 metres below the sea bed when their cage snaps off from the boat, and now must survive on less than a full tank of oxygen and with sharks circling them in the darkness. It’s basically a survival film that takes place almost entirely underwater, and luckily the story is simple enough to not get too caught up in itself, taking itself easily to a brisk 85 minutes. But the experience of watching 47 Metres Down is exactly like watching a particularly corny film on the Discovery channel, one that somehow earns its B-movie stripes and yet at the same time makes such a small impact that you’ll forget it even earned those stripes at all. It’s a film that’s all about the situation, and how frightening that can be for anyone in those circumstances, which to its credit it handles well in scenes that require the suspense to be knocked into twelfth gear, like a scene where a character swims out into the empty darkness and then can’t see where they came from. However, these are nearly ruined by Mandy Moore’s obnoxious and seemingly endless screams of peril, which make up about 95% of her dialogue so it can become very annoying really fast (and it’s not a knock against Moore as an actress; the direction and the character she’s given is just not that strong). Not once did I think going in that I would get an entirely different movie than what was advertised, but even though I got exactly the kind of film I was expecting, it still managed to surprise me in just how pedestrian and by-the-numbers it felt. Though there are some scenes of suspense that work okay, everything that these girls go through is either extraordinarily convenient or as safe as falling into a chasm of fluffy pillows. It’s a film that takes few risks and as such lacks any real sense of surprise, making it all about the experience and not really about the people who are living this experience, because characterisation is not a concern for Roberts’ imagination. Aside from a brief land-based prologue that shows them having a good time, you know absolutely nothing about these girls and it feels like you’re just watching some leftover footage from Love Island instead of actual character development (on a side note, if Love Island actually ended with all of them being trapped in a cage 47 metres under the sea, I would have actually started watching it). Roberts has made a film which, like his most recent film The Other Side of the Door, is completely serviceable and entirely disposable, and is made up of him borrowing elements from other films and placing them in his own stories. There are shots that rip of many of the Jaws films (including one that’s almost directly lifted from, of all things, Jaws 3D), and the ending not only more or less rips off the one from The Descent but in execution makes for the most bafflingly misguided fake-out since the last Twilight film. I have the feeling that Roberts is yet to really show the world what he can really do as a director, and if he continues to make schlocky films like this then he will probably never get that chance. Look, you know just from the trailers and even the poster what kind of movie 47 Metres Down is, so if B-movies with sharks are your thing then go ahead and enjoy – just don’t count on remembering much of it afterwards. 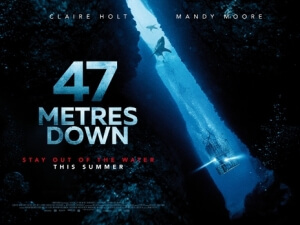 47 Metres Down is an occasionally intense but completely disposable B-movie that earns points for injecting some tension in the dark underwater scenes, but loses points for a lack of originality, almost no characterisation of its main leads, and an entirely safe execution that, given that it’s a film about sharks, lacks any real bite.